No club has a head for heights quite like are trusty friend the wedge. Whether you are faced with a shot across water or over a greenside bunker, perhaps you even found the roughest part of the rough on the course, then there is only one club to call on. Pitching wedges have a shaft length of 35 inches, the shortest in a full set and correspondingly the greatest amount of loft on the club face, around 52 degrees, or 58 degrees in the case of the sand wedge.These physical attributes offer both "feel" and the ability to give the ball plenty of air in order to sail over one of the aforementioned hazards. In the case of the sand wedge, it can dig you out of the most determined of bunkers and rescue scorecards in danger of taking a nose dive. When executing a shot with a wedge, you want to be achieving a chopping motion with the club face striking the ball before making contact with the surface of the course. 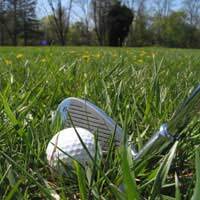 The angle of the face and the grooves on it will do the rest, sending the ball away on a steep trajectory. This interaction is helped by having the ball forward in the stance so that during the follow through the shoulders and head come up in a forward and upward direction, mimicking the ascent of the ball.How far you are from the intended target will influence both the angle of backswing and the amount of force generated by the player's trunk, each of these elements increasing corresponding to the length of shot that is required.The more subtlety that is called for, the more you want to "feel" the contact between club and ball. In some cases, players who wear a glove will take it off in this situation for just that reason. Using a wedge also calls for a steady, considered approach. In particularly tight situations, for example, where a player is aiming to escape from a steep banked greenside bunker with not much green to play with in trying to position the ball as close to the hole as possible, a great deal of backspin is called for. The backspin is created by a heavy contact between the grooves of the club face and the ball, a skill that calls for a deep breath and a steady nerve. Get it right and the golfer has no greater friend than the sand wedge; get it wrong and there will be no one to blame but yourself. Harnessing the ability of the pitching and sand wedge is crucial to the successful development of a golfer's short game. There aren't too many who can hit the green with a long approach shot, and those who do probably have Lady Luck to thank more than natural ability. The better your touch on the ball with a wedge, the more often you are going to gain yourself a positive position on the green. A lofty ambition it might be, but it's certainly worth aiming for.